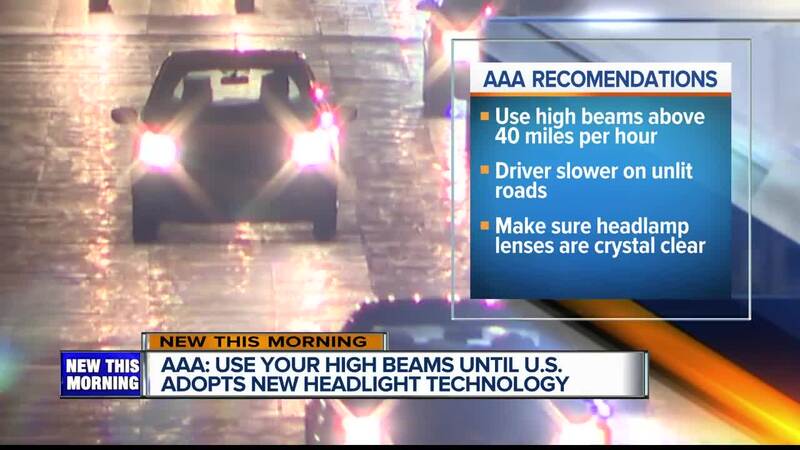 Before you put your car in drive, AAA says turn on your high beams at least until new technology becomes available in the United States. WEST PALM BEACH, Fla. — AAA is calling on the federal government to begin using vehicle headlight technology already used in Canada and Europe that they say will improve highway safety in the U.S.
Called "adaptive driving beam headlights", AAA says the headlights increase roadway lighting by as much as 86 percent when compared to U.S. low beam headlights. AAA says most low beams are insufficient at speeds above 39 mph. With this system, the high beams are always on and when another vehicle is detected that area is shaded, so it doesn’t interfere with other drivers. AAA says ADB is not allowed in the U.S. because the Federal Motor Safety Standards haven’t been updated. The proposed changes came after Toyota and the National Highway Traffic Safety Administration signed petitions that would allow manufacturers the option of putting the system in vehicles. The new headlight standards could still be a few years away, so AAA recommends drivers to use high beams whenever possible after dark. Drive a little slower when you are traveling on unlit roads so you have enough time to react if you need to stop. Also, make sure your headlamp lenses are crystal clear so your lights work better.